"How do I know who to listen to? 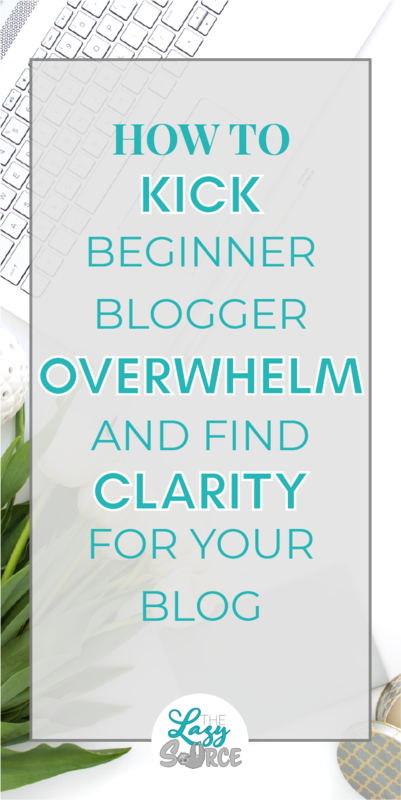 There are so many bloggers talking about blogging!" "How do I know what my next step is? What if I'm missing something important?!" "My blog isn't nearly as good as _____'s blog. What can I do to get better?" "How do I stop myself from going crazy?! I thought this was supposed to be fun!" If you're nodding your head, that's because I've been you. Heck, who am I kidding, I am you. I know this pain because I'm living it, even today. Unfortunately, these questions will probably always haunt us, in one way or another. The key is to know how to shut. them. down. Humans are addicted to information. We all want the know-how, the latest gossip, and the big news. As a result, I believe we all struggle with information overload. For a beginner blogger, this is most easily seen with a glance at your inbox. I mean, look at it. If you've been at this for a little bit, you've probably signed up for at least a dozen freebies on different websites. If you're like me, you've signed up for at least three dozen. Maybe more. I forget. The point is, I reached a point where I was getting 50-60 blogging related emails a day. A DAY, GUYS. Factor in other emails to my personal account, plus my work emails, and I was drowning. And I most certainly was not reading any of them. Not even from my favorites, because they got pushed to the bottom so quickly. This is ridiculous. It put stress on me, and it hurt the engagement rates for the bloggers I was subscribed to. They didn't want me on their list as much as I didn't want to get another email. When you're first starting, you have to explore. You're diving into a new world, and that involves both the excitement and the overwhelm of discovery. Relish the process, but be mindful. As you explore, pay attention to who really delivers. When I pared down my subscriptions, I unsubscribed to probably 98% of the bloggers I was receiving emails from. And you know what? I went from 600 unread emails to Inbox Zero. Then I went a little crazy again, so I had to start over and go from 250 emails to Inbox Zero. That just shows you that I've done it twice - which means it's possible. As I'm writing this post, I've maintained an inbox of fewer than five emails at a time for over three months now. And now? I open every email. I even take extra time to click through to the links, or reply to the blogger. This process has also helped me really get to know who I'm following. I have a little repertoire of bloggers I go to when I want to learn something new. In fact, I go to my favorite blogger's websites to search for a question before I go to Pinterest or Google! Once you get through the initial exploration phase of blogging, narrow down your circle of influencers. Find those who have similar business models to the one you want, hold the values you have, and deliver the quality you need. From memory, write down a list of the bloggers who have made the strongest impression on you through their content. If you can't do this from memory, they probably haven't made much of an impact on you! Use this list to tackle your inbox overwhelm, unsubscribing from everyone else. Side note: If you want to learn more about how I achieved and maintain Inbox Zero, let me know in the comments! So you've cut off the source of the flood. Now you're reacting to the best possible content. But what about when you need to proactively seek information? That's the obnoxious way of saying you have a question that needs answerin'. Sometimes, the overwhelm is in search results. You search one thing, find 47 different solutions, and end up down 9 different rabbit trails. You were looking up inspiration for Pinterest graphics and suddenly you're planning a webinar for the ebook you wrote at 2 a.m about gluten-free desserts even though you're still not even sure what gluten is. Sometimes, this is fun. But unfortunately, if you want to stop the overwhelm, you're going to have to start researching with a plan. Ugh, I know. So many plans. Bear with me, this is pretty simple. Know what you're looking for. "How to Pinterest" won't cut it. Be specific with your questions. Focus on your one topic. Keep a Secret board on your Pinterest account for "Read Later" if you stumble upon a rabbit trail you're curious about. For now, focus on getting your answer. Read a few different articles to get different opinions. Unfortunately, this is the internet, and you can't trust everyone. But when you start seeing the same advice in multiple places, it gets a little more trustworthy. Stop yourself after 4 or 5 articles. Don't over-research. If you've found an answer, work with that answer. If it doesn't work, go back to the drawing board. But don't get to the point where you have 15 tabs open looking for the same answer. So essentially, be specific. Stay on target. Only read 4-5 posts. Rinse and repeat. What questions have been nagging at your mind for a while? Jot them down, then go out and get them answered following the strategy above! Just answering a couple questions that have overwhelmed you can lift the weight off your shoulders. Does this sound medieval? Or maybe like Frozen? Good. That's the impression I want to give. Information is great. Learning is awesome. Market research is helpful. But it's loud. And it's a whole bunch of other peoples' ideas. At some point, you need to retreat into your own mind. You don't want your blog sounding like everyone else - that's the point of blogging! It's supposed to come from YOU. So go find your voice. And by that I mean, withdraw. Hide. Shut it down. Empty the palace. Raise the bridge. Put sharks in the moat. Arm the turrets. Get some noise canceling headphones. I suppose in real life this means turning off notifications and closing your extra tabs, but that's no fun. Sharks in the moat. The point is, you need to stop absorbing information sometimes. You need to trust yourself to create your own content and develop your own systems. When it all comes down to it, a good entrepreneur trusts their own instincts. Dedicate 5-7 days to shutting down. Don't read competitors' blogs. Don't even read your blogging emails. Think about what hurts your perception of your blog's worth - when do you feel shaken? For me, it's reading other blog posts similar to ones I've written or plan to write. Identify these things, then shut yourself off from them for awhile. Focus on creating from your own mind. If you wanna get sappy, "create from your soul." This one is easy peasy. It's even the shortest section in this post. We're bloggers, yes? We liked to write. So when you're feeling like you're going crazy - write! Write it out. Whatever is weighing on you, grab a piece of paper (way more effective for cathartic writing), and pour it all out. This can be applied in countless ways. If you're feeling stressed by all the information you're researching, take notes. If your ideas are jumbled, draw out a mindmap. If you feel like you have too much to do, start brain dumping a master list of tasks and projects. Writing is your superpower, so make it work for you. Grab a pad of paper and your absolute favorite pen. If you're in need of a stronger creative outlet, grab a bunch of pens or your favorite art supplies. Let your mind unleash on this piece of paper. Whatever is weighing you down, get it out. Draw it, rant about it, plan it, organize it, list it, anything. You may even find this piece of paper to be a great source of inspiration down the line. Don't be afraid of struggle. A study on American students found that first graders gave up on a difficult math problem after only working on it for, on average, less than 30 seconds. We're not first graders, a lot of you aren't American, and this ain't math. In any case, you can't tell me that blogging Facebook groups aren't plagued with people asking questions that they could solve with two words typed into the Pinterest search bar. Apply this to blogging. Sometimes, struggling with something that's difficult for you will be so much more rewarding when all is said and done. You can ask for advice or a little guidance, but there's still value in accomplishing it yourself. If something gets hard, don't take that to mean a wall that's blocking your way. See it as a speedbump. It's a part of running a business, honestly. If you can't overcome the hurdles put in front of you, you won't be able to sustain a successful business in the long run. Harsh truth, said it. Blogging is a challenging, but extremely rewarding journey. But you can't get the reward without working through the challenge. It's just how it works. Don't view it as your failure. View it as your opportunity. What have you been avoiding/procrastinating because it's a challenge you haven't been able to overcome yet? Move it closer to the top of your to-do list. Approach it with a plan. Identify where your issue is, break it apart into smaller steps, and create a plan of attack for each aspect of the issue. Walk away when you're feeling too frustrated. Give yourself a break, but always come back to it. Remember when starting your blog was supposed to be a fun journey? You just need to quiet the noise and focus. Such simple advice, but I know it's so much harder to implement. That's why, if you only take one thing from this post, I think you should start writing things out. Not for your blog. For you. No one has to see it. All you need to do is get your thoughts into a tangible form so you can handle the overwhelm. Speak your mind on those pages. Spill your feelings. Share your ideas. And don't freak out when you don't know everything. There's actually not a lot you need to know to run a blog. I'm serious. You'll learn everything else along the way. If you need to talk out some of your overwhelm, let it out in the comments below, or email me at katie@thelazysource.com!